I used a technique found in the Paper Perfection CD by Pat Huntoon of the Technique Junkies called Glazed Paper Accent. The Designer Paper is Basic Gray for the bat. The background is sprayed Delusions and the images are all Artistic Outpost. Artistic Outpost has a monthly referral program- link up (HERE on their blog) your card for a chance to win stamps! Love the background on this Shelly - perfect with the purple accents. Fun and very cute! Really like that sentiment too. Oh Shel, this is perfect! The colors are so bright and vivid! Nicely done, my friend! Shely, this is totally adorable. Nice vintage "postcard" feel to it. Gorgeous background. Shelly, this is adorable! Love the background! Now that is one little sweet witch! 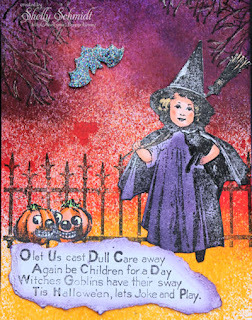 Love how you used the AO stamps and that background is a real stunner! Enjoy! Love how you made the background for this image, and your card has such a great vintage feel to it! Well done!